Taiyuan - Passengers with bulging luggage kept flowing through the waiting hall of the Taiyuan Railway Station. It was 12 days before the Chinese lunar new year, and the annual Spring Festival travel rush had begun in this capital city of North China's Shanxi province. In a 10-square-meter room off to one side, Shi Gaimei had been busy for nearly two hours, helping passengers with special needs, serving them boiled water, checking their tickets to make sure they did not miss their trains, and sometimes pushing their wheelchairs to areas on the boarding platforms with barrier-free access. A waiting-room attendant at the station for 26 years, the 50-year-old couldn't be more familiar with this scene. 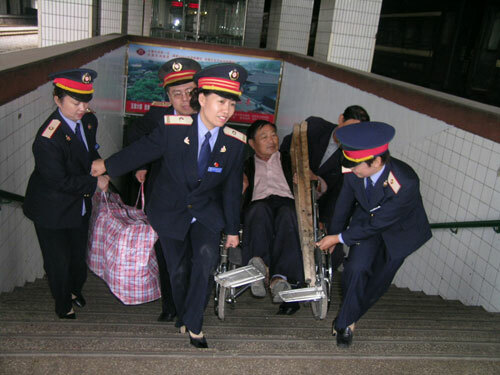 Since 2003, when the station set up the special room at her suggestion, assisting those passengers who come into the room for help - seniors, pregnant women or the disabled - has become Shi's main duty. She has in fact gone beyond the call of duty. Shi cannot remember how many times she has taken sick passengers to hospital, paid the medical bills and taken care of them until they recovered and set foot on the train home again. Neither can she recall how many times in the waiting room she has volunteered to cut hair for passengers - mostly elderly male migrant workers reluctant to spend hard-earned money before heading home for the Spring Festival. "I don't think a lot about it. I just help them by instinct when I discover passengers in need of a helping hand on their way home. It would bother me if I turned a blind eye to them," Shi said. Besides offering urgent help such as repairing shoes and mending clothes, Shi has also learned sign language and several provincial dialects to communicate with passengers. During the Spring Festival travel rush in 2000, an elderly woman with hearing and speaking difficulties arrived at the station's waiting room alone. As the passenger could neither read nor write and nobody understood sign language, Shi and her colleagues could not figure out where she wanted to go. They took good care of her for three days until someone brought a teacher from a local special education school. The teacher talked to the woman in sign language for three minutes, and realized she just wanted a train ticket to Tianjin to see her children. "I was ashamed that we couldn't help the woman even after three days of trying, but three minutes of speaking with a teacher who knew sign language could. So I decided to learn sign language in my spare time," Shi said. Now, Shi has mastered sign language, and has also taught her colleagues. About 30 attendants can use sign language to serve passengers. "Passengers' needs always impel me to learn more," she said. Over more than two decades working in the station, Shi has also tried her best to help children - assisting about 150 infants abandoned on trains or in the station and nearly 200 children who ran away from home. Born into a rural family in Hebei province, Shi was raised mainly by her father, a railway maintenance worker. Her mother died of illness when Shi was only 14. Before working in the station as an attendant, Shi worked in a factory for nine years. "After years of hard life experience in rural areas and hard work in the factory, I find duties in the waiting room are simply a piece of cake," Shi said. "For instance, some attendants think migrant workers are dirty and keep away from them. But having grown up in a rural area, I feel they are just like my brothers and sisters." For her efforts, Shi has received many honors, including the National-level Model Worker and National Top 10 Youth for Minor Protection. Every day, she serves about 80 passengers with special needs. But her daily workload doubles during the Spring Festival travel season, when the world's largest annual human migration challenges the country's rail system. Long lines and large crowds trying to buy train tickets at stations across the country are frequently reported. Some wait up to 24 hours before finding tickets are sold out. Complaints about not being able to buy a ticket are common. "I hope my services not only make passengers more comfortable on their journeys home, but also win more understanding from these passengers toward our railway workers," Shi said. Over the past 26 years, Shi has spent only two Spring Festival evenings with her families. Shi said she feels very sorry for her daughter and husband, and sometimes while working the Spring Festival evening a sense of desolation overwhelms her. But Shi said that as one of the 2 million railway workers nationwide who work long hours during the festival, her only new year's wish is to make passengers' journeys home safe and comfortable. Wang Xiaolei contributed to this story.